Note: Click here to download Mark’s top Fiverr tips for 2015 and beyond. When I first started The Side Hustle Show, I knew I wanted to feature success stories from a number of different marketplaces. I’d say there have been a few themes that have emerged on the podcast since then, and one is definitely to “go where the buyers are” and take advantage of these pre-built marketplaces instead of blazing your own trail. Marketplaces like Amazon, Udemy, Etsy, Airbnb, Uber, and yes, Fiverr. Twenty months and 90 episodes ago, I was introduced to the incredible story of AnarchoFighter, the Top-Rated Fiverr seller who earned enough cash on the platform to buy a house. To this day, it remains the most downloaded episode of the show (though Andy Slamans and the Amazon private labeling business is giving him a run for his money lately!). That episode convinced me to give Fiverr a shot as a seller myself, and it’s turned into a fun side hustle income stream. In fact, a couple weeks ago I was promoted to Top-Rated Seller myself … I have a sneaking suspicion my then-upcoming call w/ Anarcho (aka Mark) might have had something to do with it. 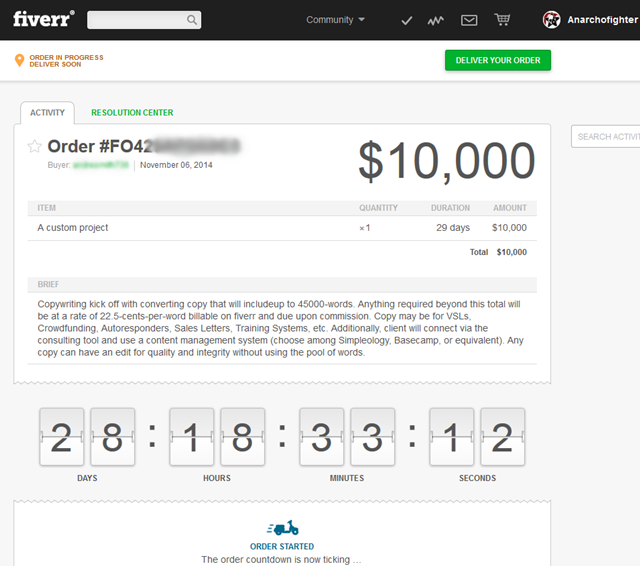 Since we last spoke, Fiverr has implemented a bunch of changes, including the option to create custom quotes up to $10,000. Yes, you can now make a sale of up to $10,000 on Fiverr, the platform that started out with everything for a fixed price of $5. “It’s easier to take a customer from $5 to five-figures than it is to take someone from $0 to $1.” << Click to Tweet! Note: Fiverr recently opened up Custom Quotes to Level 1 Sellers as well, not just Level 2 and above as noted in the call. Click here to download Mark’s top Fiverr tips for 2015 and beyond. Fiverr: First-time customers get a free gig! The story behind the $10k Fiverr sale. How sellers of non-visual gigs are allowed a PDF “portfolio” document that can be used to address FAQs and pre-sell a customer. Mark’s recommendations on what kind of gigs you can sell, and how to set them up for success in terms of traffic and orders. A quick hack for getting a critical mass of new customers and social proof to your gigs. How Mark is delivering his base gigs (not PDF files anymore). How the custom quote feature has helped double his average order value since we last spoke. How I’m maximizing positive reviews under the new 5-star rating system. The pros and cons of the new Fiverr Anywhere program. The 4 P’s of doing business, not just on Fiverr. Mark is obviously killing it with fiverr. I do wonder though, it seems that the search system can be abused as I’ve noticed a number of users who make two and three gigs of the same type without much variation in order to get ranked higher. I wonder if Fiverr is going to crack down on this type of behaviour or if this is going to be used as a marketing strategy? I’ve seen that as well. I guess I should use it to my advantage, create several similar sounding gigs to show up in more searches, have a better chance of being discovered. The downside may be you spread your review/feedback base over too many offerings so none of them really gains that much oomph. But yeah, not taking advantage of all 20 gig slots is a weakness on my end right now. I am a big fan of Mark’s! He is amazing, everyone should put these ideas to use now! Thanks Letitia — I was taking notes like a crazy person during the call! Thanks for this show Nick! The amount of worthwhile knowledge that Marc gives in the interview is incredible – a bunch of it not even being Fiverr related. I don’t think I’ve ever felt that level of overwhelming generosity from a free podcast before. Love hearing that. Thanks Adam! This is a great interview. I listened to it a couple of months ago when I first started on Fiverr (I think August). I’m already meeting my sales goals and just got promoted to Level 2 yesterday. Woohoo – nice work Toni! Great podcast Nick, thank you! I’ve been a user of Fiverr for awhile, but until I heard these episodes with Anarcho, I had never considered selling my services on the platform. Do you know if you can have more than one seller id? I have a few different side hustles in very different fields. Not sure that it would make sense to offer them as separate gigs under the same seller id. Have been trying to download the PDFs for a couple of your podcasts (this one and show 75) — tried last night and tried again this evening — but haven’t received them in my inbox. Have checked Spam and Bin, and am not using any adblockers or similar on your site. Maybe there’s a problem with your autoresponder, LeadPages, or whatever? Hey Tim, so sorry for the trouble! I’ll send them over right now. And great podcasts, btw — always lots of actionable info, and always plenty of good questions that keep the audience’s needs firmly in mind (the sign of a good interviewer, I think). hello. I’m glad I found your website. What is the difference between go daddy and bluehost and which would be better to start a blog to hopefully earn income on? Thanks.